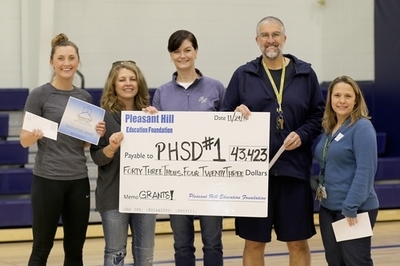 Each year, PHEF funds are distributed to the Pleasant Hill School District for Innovative Educator Grants. The grants awarded range from individual classroom grants to grants for entire grade levels and across multiple grade levels. Grants are funded through the generosity of our donors, using funds raised throughout the year. Unrestricted gifts fund the majority of the grants, while designated gifts allow the donor to support a specific program. No matter how you designate your gift, you are helping the students of the Pleasant Hill School District! Grants applications are submitted each fall by teachers, administrators, and student groups. The Pleasant Hill Education Foundation Board of Directors and outside committee members review grant applications and vote on funding. Funds are distributed in November for use during the current school year.